This summer, we saw the emergence of gingham everywhere! You know that the southern girl in me loved that so much. A classic pattern suddenly incorporated into darling styles everywhere you turn? That’s one “trend” I can get on board with! Now that we’ve begun to settle into autumn, there’s no need to stow away this fun print. Used correctly, it will work well into fall! So what’s the secret? Pair your gingham with deep colored pieces. Stay away from whites and light washes, and opt for dark navies, hunter greens and rich burgundy shades instead. 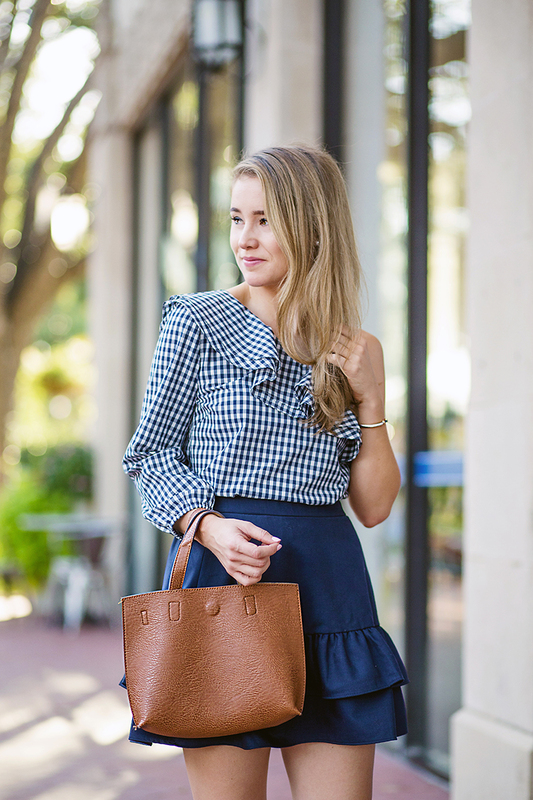 Here, I paired a gingham shirt (that looked darling with white jeans and wedges a few months ago) with a crisp, ruffled navy skirt and tan accessories. This would also look darling with dark blue or green denim and riding boots. Before signing off, can we just take a moment to give a round of applause to J.Crew this season? They’ve been killing it, lately. I’m so excited to see what the line has in store for the holiday season! Gingham works for every season!